Vmed uses SunTech Medical Advantage Vet Software which performed significantly better and with less variability than Cardell and Critikon Dinamap monitors on awake and anesthetized cats when compared to the Doppler reference in a controlled study at the North Carolina Stale University College of Veterinary Medicine . Performance on awake and anesthetized dogs was comparable for all three monitors. resulting in fast, accurate measurements. Accurate measurements have been obtained on patients as small as 1.5 kg under anesthesia. Includes manual and automatic modes for diagnostic and surgical applications. In manual mode the measurement cycle is started each time a measurement is desired. Automatic mode allows repeat measurements taken at user defined intervals. Motion tolerant software reduces the compute time for awake animals without compromising accuracy. 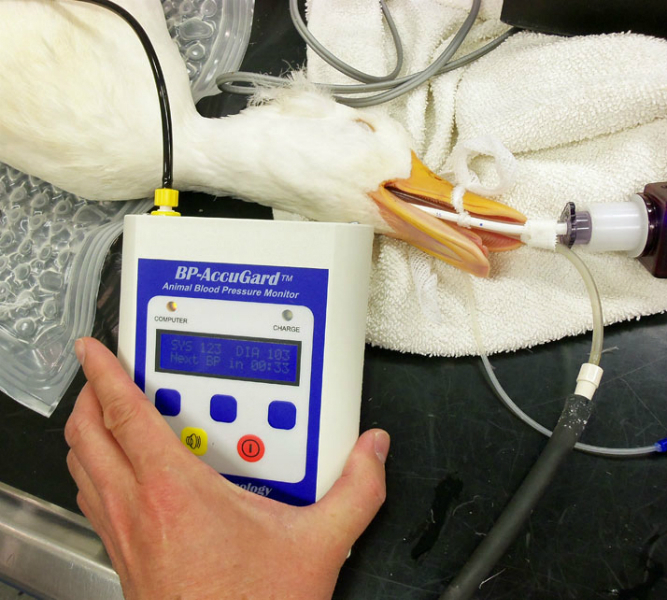 BP-AccuGard offers superior, animal validated, motion tolerant technology for fast, accurate measurements in animals as small as 1.5 kg. Measure systolic, diastolic, MAP and heart rate and with a single key stroke, automatically calculate mean measurements over several readings for best accuracy. Use as a stand-alone blood pressure monitor or include the optional PC-Display software and Bluetooth wireless link to display measurements, real-time blood pressure waveforms and a trend graph on your computer screen. PC-Display software stores all measurements for the surgical or diagnostic record. When used in the automatic mode and in conjunction with the PC-Display software, measurements are saved to file for a record of pressures through the procedure. Files saved to the computer can be attached to patient records in most practice management programs. Reports can be printed from your computer or network printer or automatically attached to an E-mail message. The optional Bluetooth hardware and PC-Display software provide a wireless connection between the AccuGard and your computer allowing the computer to function as a convenient patient monitor. The computer displays digital measurements as well as waveforms for the measurement cycle, pressure oscillations and a trend graph. Measurements appear simultaneously on the AccuGard. Bluetooth signals are omni directional and operate free of signal interference in the clinic. Range is reduced when transmission is through walls or between floors. Go Wireless…Go Digital with Vmed Bluetooth wireless monitors. Bluetooth is free of interference and is omni-directional to a range of 100 meters, line of sight. All controls except keyboard entry are at the patient’s side. Save space, eliminate cables and store files automatically. 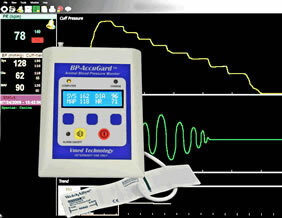 Establish a wireless link to your Windows desktop, laptop or tablet computer to display real-time patient monitoring waveforms and digital data on your computer screen. Monitor up to seven patients on one computer. Files may be recalled for review, transmitted by email or printed in a concise report. All hardware, software and monitoring accessories are provided with our monitors as described below. Compatible with Windows 8, 7, Vista and XP computers. Vmed wireless monitors now Integrate with AVImark®. See these instructions. 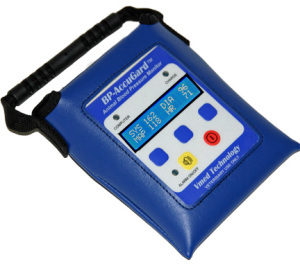 Use in manual mode to screen for hypertension in the exam room. Record BP routinely for patients where hypertension is secondary to disease and for all patients with visual problems and all critically ill patients. Use in automatic mode for surgery. Select specific measurement cycles and alarm limits for systolic, diastolic, MAP and heart rate. Alarms can be easily silenced by pressing the silence alarm button.